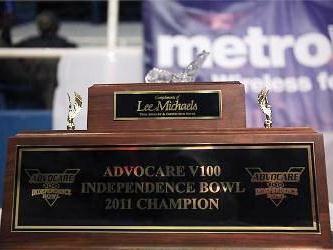 Shattered: The 2011 AdvoCare V100 Independence Bowl trophy. 2011: Truman the Tiger, mascot for the University of Missouri, accidentally drops and shatters the 2011 AdvoCare V100 Independence Bowl trophy (which had a crystal bowl on top and was reserved for the winner of this day’s bowl game between Missouri and the University of North Carolina). Asked by a reporter if he broke the trophy, Truman nodded. Then he threw his paws in the air, and covered his eyes to mimic sobbing. As for the game, Missouri defeated UNC 41-24. 2002: In a Black Thursday for Atlanta professional sports, the NHL’s Atlanta Thrashers fire head coach Curt Fraser and the NBA’s Atlanta Hawks dismiss head coach Lon Kruger. Fraser was 64-173-31-15 during his tenure while Kruger compiled a 69-122 record. 2001: A two-seat plane breaks free from its moorings at a rural Sonoma County, California, airstrip and flies 35 miles without a pilot before running out of fuel and crashing in a neighboring county. The plane’s owner, Paul Clary III, 67, was fixing the 1946 Aeronca Champion’s flooded engine when the aircraft suddenly took off without him.